This year’s Westin-UNICEF Charity Ball hosted by The Westin Cape Town on Saturday, 14 October, was a memorable marriage of beauty, talent, humanitarianism and generosity coming to life in one room. Influentials, media, private philanthropists and socialites came together to celebrate UNICEF’s work for children. UNICEF National Ambassador, Jo-Ann Strauss, including business woman and media celebrity Carol Bouwer were also in attendance. In 2016, The Westin Charity Ball raised an R1 million ($75 341.02 USD) which was donated to various educational programmes promoting early childhood development in South Africa. This year, this figure has been matched, and funds will go towards supporting this UNICEF cause and core priority. 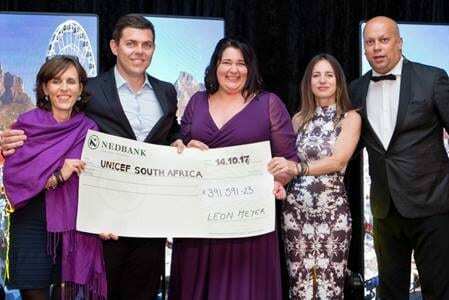 As part of this amount, on the same night, the Ernest Stempel Foundation handed over a cheque of R 200,000 to UNICEF. From left: Carine Munting – UNICEF Partnership Manager, Leon Meyer – General Manager The Westin, Marilize van Niekerk – Executive secretary to the General Manager, Sandra Bisin – UNICEF Chief of Communication and Partnerships and Jeremy Harris – radio personality and event MC. A total of 27 prizes sponsored by various industry partners, including an autographed T-shirt by professional tennis player Roger Federer, were raffled at the event. Further, event sponsor – Toy Kingdom South Africa donated toys to the value of R270 000, which included 1 000 toys for boys and 1 000 toys for girls, the donated toys were valued at R250 000 and an additional R20 000 toys were donated on the night. “We feel honoured to be a part of this extraordinary cause. In the world we live in, the ‘your child is my child’ approach has become extremely important. We have a responsibility to protect and nurture our children and place their needs and development at the top of our list – it’s absolutely crucial,” said Henri van Wijk, managing director, Toy Kingdom South Africa. Leon Meyer, General Manager at the Westin Cape Town agrees. He says hosting the UNICEF Charity Ball was a proud moment for him and his staff, and the Marriott International. Inc. He said he was especially proud of event organiser, Marilize van Niekerk of the Westin, who has been awarded the UNICEF Hero Award for 2016/17. He also thanked, Ibrahim Barghout, Area Vice President of Marriott sub-Saharan Africa for attending the event and demonstrating his commitment to UNICEF’s cause and the organisation’s child-sensitive, child-driven programmes. “It’s a privilege to be associated with a global organisation like UNICEF. The work they do in our country and around the world for the most-vulnerable is admirable,” Meyer said. The first two to three years of life have a profound effect on a child’ future – on his or her health, education, wellbeing and financial success as an adult. When parented with love, nourished and cared for in safe and stimulating environments, children develop the cognitive, emotional and behavioural skills they need to embrace opportunity and bounce back from adversity. Yet, in South Africa, one in three children experiences violence during their childhood. Children under the age of five are at particular risk of violence and maltreatment in the home – including corporal punishment – and are the most vulnerable to the long-term negative effects. “Thousands of children in South Africa are still denied protection, love, good food and play that will support their growth and development. But I’m hopeful because of this gathering tonight and I am grateful to those of you I’ve met who arecommitted to fight for a more equal world, to fight for a greater world, for every child”, said Sandra Bisin, UNICEF South Africa Chief of Communication & Partnerships. During the event, 19 year-old Siphokazi Dayimane, who has been part of one of the programme, an innovative job shadowing programme that helps strengthen girls’ entry and learning in technical fields the economy requires: science, technology, engineering and Mathematics (STEM), supported by UNICEF, the Uweso trust and the Government of South Africa. Siphokazi shared her personal story. Other sponsors for this event included: SANTAM insurance, Sanlam Insurance, investment and financial planning, as well as the Ernest E Brendalyn Stempel Foundation.